Please list any Mastiff Books here that you have enjoyed and tell us a little about it. Good or bad, please give us your reviews! Here are some books on Mastiffs. If you would like to order any of them simply click on the link of the book..
750 plus pages -large format - hard to find. (out of print) Usually sells for $600-$1200 dollars. I personally feel this is the best book ever published on the Mastiff. The photographs are clear and depict most of the best mastiffs in History. The chapters on history and breeding and notes on individual dogs are the best ever written (my opinion!). This book is worth saving up for and worth the hunt. It is sometimes offered on eBay, and will be the best book money you ever spend. Mastiff Aristocratic Guardian by Dee Dee Andersson My husband really enjoyed this one. The Mastiff by Marie Moore This is the first one I read way back when. It's still one of my favorites. The Complete Mastiff by Baxter and Blaxter. Very nicely presented and very informative. I have other mastiff book but this one is my favorite!! This book is a great childrens book. Susan Krauzer is an owner of Mastiffs and this book is about a brindle mastiff puppy named Lilith that feels so out of place because she is the ONLY brindle in her litter everyone else is fawn. I have taken this book to my kids school every year and read it to their classes. The children enjoy it and I feel that it is a great collector. The Henry and Mudge books are great to they are by Cynthia Rylant. Mudge is A Mastiff and he and Henry have great adventures in their series. Mastiff's are angel's with wings. "Lord help me be the person my Mastiff thinks I am"
I just ordered "Raw Dog Food" by Beth MacDonald, I think that's her name? Does anyone have it, and if so do you like it????? 2004 Dog Writers Assn. of America Writing Competition Winner, Best Reference Book! Have you ever wondered how dog show judges learn to identify the subtle differences that separate a dog that is merely good from a dog that is outstanding? Now you can develop your own eye for sound movement and structure and learn how color, marking, size, and even leash position affect the judge’s perception. You get to actively participate in over 100 judging scenarios similar to what a judge encounters in the show ring and compare your opinion with the author’s. Dog Writers Association award winner. I highly recommend this book for mastiff owners and all breed fanciers who wish to understand subtle structural differences that can influence a judge's eye. After reading the book, one might have a better understanding of "daylight" under the dog, among other things and how it can impact on overall form! Nearly died when I saw the going price for Grandeur and Good Nature - we'll just to have to ask Joan to put another one together for us! Really enjoyed Col David Hancock's book, The Mastiffs - The Big Game Hunters. Great research! 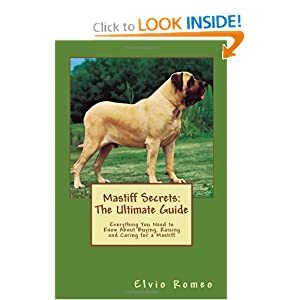 The Ultimate book of Mastiff breeds, great article on temperament and character as well as the Mastiff section by Lyn Say and the BM section by D. Oliff. 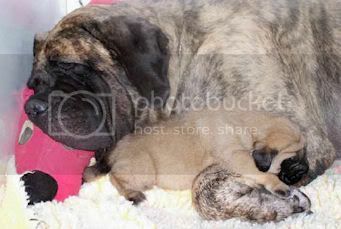 How to raise and Train a Mastiff by Marie Moore, it is a small pareback but worth the cost just for the old pics. My favorite is Dee Dee Andersson's Mastiff book. I love the section about the breeder's/kennel's who contributed to what the Mastiff is today. If you have the book "Grandeur and Good Nature, the Character of the Mastiff by Joan Hahn", please contact me at [paharts at gmail dot com]. I would really really appreciate it if you would try to find something in the book for me. You would be my and I would appreciate it forever! I just bought and read a really good book - I am absolutely amaized at all the great information and ideas in it. I wish I had read this one years ago - it would have saved me a lot of frustrations!! Anyone know of a good Dog first aid book? Tired of the vet telling me they won't give me any advice unless I bring them in when I know what the issue is and I know its not a big deal lol. Anyone know where I can get a copy of Lillith A. Willith. Amazon does not have it and none of the stores in Australia are any help either. I have had parents come in with there kids and remark "look honey there's Mudge. So I bought some of the Henry and Muge books for the lodge. I know this is wayyyyyyyy late Tiffany, but Dr. Pitcairn's Complete Guide to Natural Health for Dogs & Cats is my favorite all around pet book, everything from feeding to emergency first aid. Richard Beauchamp's Solving the Mysteries of Breed Type is a favorite, and and Eye for a Dog is also excellent. For handling, George Alston's book is another good one, another favorite red covered book is the History and Management of the Mastiff. Okay, now we all know I am a book worm . . . Finally a Complete Guide You Can Follow to Raise a Happy, Healthy Mastiff That Thrives for Years & Years & Years ! * The Mastiff's appearance and breed standards - plus, what physical characteristics to look for when you go to buy a Mastiff! * How Mastiffs relate to children, family members, strangers, other dogs, and other animals - plus, what's really behind Mastiffs somewhat contradictory nature and how that should impact the way you treat your Mastiff in the future! * What you need to know about feeding and grooming your Mastiff to ensure it stays healthy and happy over the long-term - both feeding and grooming needs will change as your Mastiff grows, find out exactly what you need to do at each stage of development here! * How to recognize and treat common Mastiff health issues before they become major problems! * How to socialize and train your Mastiff - want the perfect pet ... you'll be amazed at how easy it is to accomplish when you follow these simple socialization and training tips! * A complete chapter on Mastiff breeding. Do you think you want to breed Mastiffs? Read this chapter before attempting anything! Raw Dog Food by Carina Beth MacDonald is a great book and takes some of the "scariness" out of feeding raw. One of the many books I used and enjoyed when I first started feeding raw. Lucie Fainsbert has a new book coming out. This book is awesome, have a signed copy by Joan, My mastiffs are the first chapter of the book Thor and Molly, if you have it read up on our story. I wrote a letter to god when I was 8 years old, I was devastated by the death of my dear molly, I was 10 when I got my dog Hera, I have a photo of her and I on a snowy day as my main profile photo. playmates section of the book there is a pic of me with sister and Mastiff at my godfather's home, dog is eating cake off the table...lol! Hi Kristie, thank you. Oh Im wondering if I have been on this forum before but years ago. Hello Mastiff Lovers. I have enjoyed reading all your posts. I was "IN Mastiffs" in England form the mid eighties until the late nineties and the breed is still very close to my heart. I do own the book 'Grandeur and Good Nature' and I may be willing to part with it for the right price. I still get hours of enjoyment out of it but I think it may be the time to pass it on to another real mastiff lover. I am looking for somewhere between £800 and £1200 pounds Sterling. If anyone is genuinely interested in owning this book, my telephone number is UK01282713119.